An Iranian Kurdish man living in Nottingham has sewn up his eyes, ears and mouth in protest at his treatment by the Home Office. 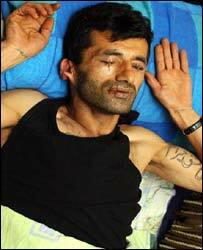 Abas Amini, 33, has been on hunger strike for a week and doctors say he could die within days. He was granted asylum two months ago but his protest was triggered by a Home Office decision this week to appeal. If he is sent back to Iran, he says he will be executed for his political past. Tania Branigan, a journalist who has been following his case, says his claims of being tortured in Iran are genuine. "He's actually a fairly well-known political poet. "He's also been a Communist guerrilla for many years, since his early teens in fact, and has been in and out of prison for much of his life, has been tortured repeatedly. "And in fact his claims of torture were backed up by the Medical Foundation for the Care of Victims of Torture." He is reported to be threatening to burn himself to death if anyone forces him to eat and has a bottle of petrol close at hand just in case. Mr Amini fled jail in Iran for Britain two years ago, where he applied for asylum. The medical foundation's report backing his torture claims was submitted with his application. But the asylum process has been difficult for Mr Amini, who at one stage was denied some benefits because he refused to move house. His wife and three-year-old son have remained in Iran. After five adjournments, an immigration tribunal said he could stay, but the Home Office disagreed and decided to appeal. Now Mr Amini is refusing all medical attention, including antibiotics and painkillers, despite developing an eyelid infection. He says he will stop his protest if the government withdraws its appeal. Mr Amini told BBC News through an interpreter: "I spent many years in prison being tortured; I was forced to flee here. "Shouldn't a human being have a square foot of earth to live on to live in peace?" Sam Azad, of the International Federation of Iranian Refugees, said Mr Amini had told him he was taking a stand for all the people in this country suffering from a lack of human rights. "It is just too much for him and he needs support, not to be antagonised and messed about," Mr Azad said. "He has not had any financial support for the past three months from the Home Office. "He is stable but weak, and a doctor is looking at him, but he is alert." Dr Chris Udenze of Nottingham, who is treating the hunger striker, said Mr Amini is depressed because of his situation, but he is of sound mind. "I don't think it would be legal under the mental health act to force feed him. We have to respect his rights to make a decision like this for himself." National agencies believe the protest is the first of its kind in the UK. But there have been other demonstrations against the system this year. A group of asylum seekers held at the Haslar detention centre, near Gosport in Hampshire, have carried out two hunger strikes saying they should not be treated as criminals. A Home Office spokesman said Mr Amini's actions were "deeply regrettable". Last year, asylum seekers at an Australian detention centre sewed their lips together in protest against the conditions. "Abas Amini has been on a rollercoaster of hope and despair"
Head to head: Migration amnesty? What next for illegal migrants?